[Busan KAPCA] We need your support for the press conference urging an appeal of the Sangae-dong Dog Meat Market cruel slaughter case. 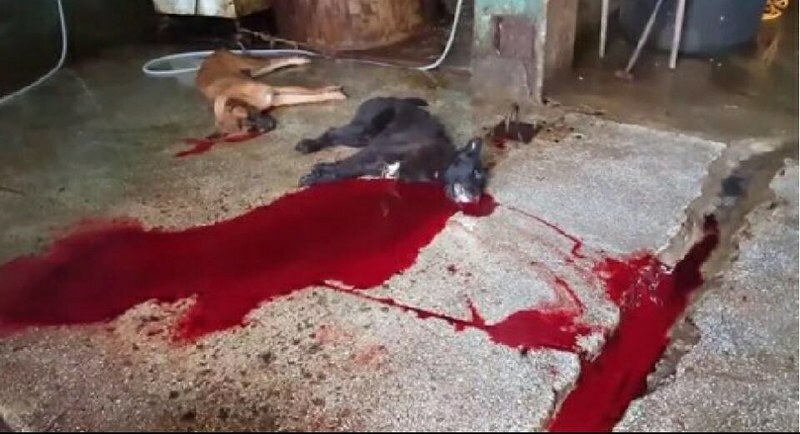 Home / Blog / [Busan KAPCA] We need your support for the press conference urging an appeal of the Sangae-dong Dog Meat Market cruel slaughter case. We need your support for the press conference urging appeal of Sangae-dong Dog Meat Market cruel slaughter case. Ulsan District Prosecutor’s Office decided not to charge the owner. They also suspended the prosecution/indictment of the worker. Namgu District Office agreed with the decision of the Prosecutor’s Office and will not appeal. Namgu District Office have stated that they will heighten inspections. However, BKAPCA’s argues that: if law enforcement is going to do nothing about these illegal acts, then why would the perpetrators change the way they do things? Busan KAPCA and KAWA are holding a joint press conference on 12/1 at 10:30 am, at the Ulsan Southern District Office. If you live in Ulsan area, please attend and show your support. Thank you! 지난 여름 말복날 울산 상개동가축시장에서 개고기용으로 개를 잔인하게 도살하던 현장을 울산시청과 남구청 담당자, 그리고 부산동물학대방지연합 소속 명예감시원들이 적발을 하였습니다. 이 사건은 개도축장에서 살아있는 상태로 목을 찔러 피를 뽑은 점, 동종의 동물이 보는 앞에서 죽인 점 등 동물보호법 제8조 동물학대등의 금지 위반이 명백하여 울산 남구청에서 경찰에 고발을 하였고 사건은 검찰로 송치가 되었습니다. 그러나, 울산지방검찰청은 개도축장 주인에게는 무혐의, 종업원에게는 기소유예 처분을 내렸습니다. 기소유예는 무혐의와 다를바 없습니다. 동물보호법 제8조를 위반한 자는 동법 제46조 벌칙 조항에 의거 1년 이하의 징역이나 1천만원 이하의 벌금에 처하게 됩니다. 또한, 업주가 직원에게 잔인한 방법으로 개를 도살하게 하였다면 형법상 교사의 죄를 물을 수도 있습니다. 그럼에도 불구하고, 울산지방검찰청은 업주와 직원에게 면죄부를 준 상황이며, 이 결과는 검찰이 제대로 사건을 수사하지 않아서 나온 결과라고 주장하고 싶습니다. 또한, 울산남구청은 검찰결과에 따른 시민단체의 항의에 마지못해 항고를 하겠다고 발표를 하고선 어제밤 갑자기 항고를 하지 않겠다며 이 처벌결과에 만족한다는 의견을 표명했습니다. 이런 울산남구청의 입장은 오로지 행정편의주의적인, 사회의 제도와 시스템을 무시하는 행정의 갑질이라고 규정합니다. 본 건에 대한 항고 등의 법적 절차는 오로지 고발자인 울산남구청만 진행 할 수 있기 때문입니다. 항고를 하지 않고 단속을 철저히 강화하겠다는 울산남구청 담당계장에게 묻고 싶습니다. 이 같은 결과에 승복을 해 버린 공무원의 단속을 그 누가 두려워 하겠습니까? 앞으로 잔인한 도살이 거리낌없이 행해질 가능성만 커지게 되었습니다. 이런 명백한 도살현장도 이런 가벼운 처벌이라면 앞으로 개도살업자들이 얼마나 마음놓고 설쳐댈지.. 끔찍합니다. 울산남구청은 즉각 항고를 진행하여야 합니다. 부산동물학대방지연합과 동물자유연대 부산지부는 내일 울산남구청 앞에서 기자회견을 열어 항고촉구를 다시 할 예정입니다. 일인시위 지원자가 있을 경우 일인시위도 할 예정입니다. 날짜가 임박한 것은 알고 있으나 항고기간 때문에 어쩔 수가 없습니다. 내일 참여가능하신 분은 오셔서 힘을 실어주시기 바랍니다. *일인시위에 지원해주실 분 계시면 연락주십시오. *참여못하시는 분들은 울산남구청과 울산시청에 항고촉구하는 민원글을 남겨주시길 부탁드립니다. Please stop this barbaric practice – it is unbelievably brutal , cruel and desperately inhumane . It is terrible, it is inhuman, I think that only people absolutely deprived of a feeling can make such a thing !!!! Now I boycott products made in S. Korea !! I hate that this happens the people who do this are so cruel and evil. And the people who walk by and let it happen are just as much to blame. Please tell me someone helped the poor dog that they find alive in the video even if they couldn’t save the dog they could at least tried to offer it some comfort in its final moments. That the people filming don’t immediately go to help the dog is very upsetting for me. Sick, sadistic, ignorant humans! The world looks at you with compete disgust because you are heartless, mentally sub-standard people who lack any form of normal human compassion. Stop torturing helpless, innocent animals! PLEASE WE DON´T NEED MORE CRUELTY IN OUR WORLD, WE NEED TO STOP THIS SADISTICS ACTIONS IN THE PLANET. THIS ISSUES CONCERN ALL THE PEOPLE IN THE WORLD. THIS IS VERY SICK AND PROMOTE VIOLENCE IN THE SOCIETIES. Die well by Living well…Justice will Prevail! Speak up, Take action and Never give up. Without ethical morality, one does not deserve of being a human. I HAVE NO WORDS ADEQUATE ENOUGH TO CALL THESE “PEOPLE” THEY NEED WIPING OFF THE FACE OF THE EARTH . EVIL !